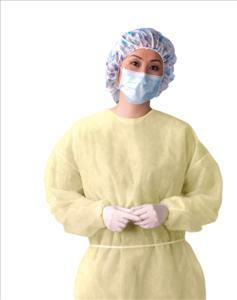 Medline's classic fluid-resistant multi-ply gowns are breathable, flexible and strong enough for tough duties. Made from lightweight fluid-resistant multi-ply material. Gowns are generously sized for full coverage and flexibility. Constructed with elastic wrists, waist and neck ties to ensure secure fit. Ten gowns per bag, flat pack. Lightweight, yellow. Regular/Large size.